As in the original Tekken Tag Tournament, matches involve each player selecting two fighters to fight with. Players are able to switch their fighters out at any time, allowing the inactive character to gradually recover some life they might have lost. At certain points, an inactive character's life bar may flash, giving them a temporary boost in strength if they are tagged in. If the life bar of either of a player's fighters runs out, that player loses the round. If time runs out, the player who has the most cumulative life remaining amongst their fighters wins the round. Tekken Tag Tournament 2 Unlimited is an update to Tekken Tag Tournament 2. It features a number of new items and customization options. It also gives the game a balance update from characters and items. In Unlimited, the player can switch a ratio between Tag mode and Solo mode ("2 vs 2", "1 vs 2" or "1 vs 1"). There is also a "Pair Play" mode, which allows four players to fight simultaneously in pairs of two, much like the "Scramble Mode" in Street Fighter X Tekken. The Unlimited version also features the "Rage" system from Tekken 6 for Solo mode characters, and the new tag partner Rage system from the original arcade version of Tag Tournament 2 for Tag mode characters only. "Rage" gives characters more damage per hit when their vitality is below a certain point. Once activated, a reddish energy aura appears around the character, and their health bar starts to flicker in red. The "Netsu Power" appears when an on-screen character gets attacked a certain amount of times and the off-screen character's lifebar flashes. If the on-screen character tags out while the off-screen character's lifebar is flashing, the tagged character becomes slightly stronger. Tekken Tag Tournament 2 Unlimited is an update to Tekken Tag Tournament 2. It features a number of new items and customization options. It also gives the game a balance update from characters and items. In Unlimited, the player can switch a ratio between Tag mode and Solo mode ("2 vs 2", "1 vs 2" or "1 vs 1"). There is also a "Pair Play" mode, which allows four players to fight simultaneously in pairs of two, much like the "Scramble Mode" in Street Fighter X Tekken. 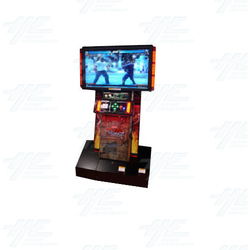 The Unlimited version also features the "Rage" system from Tekken 6 for Solo mode characters, and the new tag partner Rage system from the original arcade version of Tag Tournament 2 for Tag mode characters only. "Rage" gives characters more damage per hit when their vitality is below a certain point. Once activated, a reddish energy aura appears around the character, and their health bar starts to flicker in red. The "Netsu Power" appears when an on-screen character gets attacked a certain amount of times and the off-screen character's lifebar flashes. If the on-screen character tags out while the off-screen character's lifebar is flashing, the tagged character becomes slightly stronger.